Warming sensation in a specially formulated coated caplet. 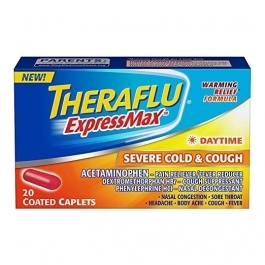 New Theraflu ExpressMax Nighttime Severe Cold and Cough Caplets help relieve severe cold, cough, and flu symptoms whenever you need it most, providing maximum strength* medicine without a prescription. Get relief from nasal congestion, cough, body aches, sore throat, sneezing, headache, runny nose, and fever. A specially formulated coating provides a warming sensation you can instantly feel, letting you know that powerful nighttime relief is on the way. *Maximum-strength per 4-hour dose. Directions. Do not use more than directed. Adults and children 12 years of age and over: take 2 caplets every 4 hours, while symptoms persist. Do not take more than 10 caplets in 24 hours unless directed by a doctor. children under 12 years of age: do not use. Diphenhydramine HCl 12.5mg;Phenylephrine HCl 5mg;Acetaminophen 325mg, Benzoic Acid, Croscarmellose Sodium, Ethanol, FD&C Blue No.2 Aluminum Lake, Ferrosoferric Oxide, Avors, Hypromellose, Magnesium Stearate, Maltodextrin, Microcrystalline Cellulose, Polyethylene Glycol, Polysorbate 60, Polysorbate 80, Povidone, Pregelatinized Starch, Propylene Glycol, Silicone Dioxide, Stearic Acid, Sucralose, Titanium Dioxide. Tamper Evident Feature: Theraflu ExpressMax caplets are sealed in blister packets. Use only if the individual seal is unbroken. ;This product contains acetaminophen. Severe liver damage may occur if you take more than 4,000 mg of acetaminophen in 24 hours, with other drugs containing acetaminophen, 3 or more alcoholic drinks every day while using this product. ;If sore throat is severe, persists for more than 2 days, is accompanied or followed by fever, headache, rash, nausea, or vomiting consult a doctor promptly. ;Acetaminophen may cause severe skin reactions. Symptoms may include: skin reddening, blisters, rash. If a skin reaction occurs, stop use and seek medical help right away.